Today’s post is by guest writer Victoria Greene. Victoria is a freelance writer and branding expert; visit her site at Victoriaecommerce.com. It’s no easy task taking up a new life abroad as an international student. You have to cope with things like homesickness and the culture shock of living in an entirely different country. Finances can also be a challenge, but you may have the option to self-finance and lighten the load. If you are an adult going abroad, you may have the option of supporting yourself through casual work — but be sure to check the working visa rules for your host country. If you aren’t allowed to work due to your age or visa restrictions, it could be that the best option for you is to work in the year preceding your study abroad experience instead. (This would also allow you to fully focus on your studies while abroad, and not get distracted by a part-time job.) Another option would be to start an online business back home that needs little day-to-day running and just keep things moving along while you’re away. With that in mind, this post will present possible five options for financing your study abroad experience, regardless of your skill set and schedule. If you’re studying abroad as a university student and if your visa allows it, you are in an excellent position to offer advice and guidance to other students looking for help with tutoring. Ask your professors if they have any tutoring positions available. Alternatively, you could look elsewhere and send your CV to other schools in your area. Think about conversation classes and book clubs to get you going for tutoring in your native language. Online tutoring is also an option to think about. You will need a webcam, mic, and headphones, as well as a reliable internet connection to help you get started. You could also sell your other specialized skills by setting up an online video course, using sites like iSpring. These platforms allow you to film your course and charge people to download your lesson plans. If you have skills in things like crafts or illustration, share them online! Just make sure that your tutoring role and efforts don’t take away from your own studies. A more informal (and unpaid) language swap or skills exchange is also a great way to help others and make new friends at the same time; you might not be paid for this, but you won’t have to worry about visa requirements and you’ll certainly have some fun. 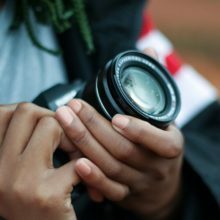 If you are handy with a DSLR camera, consider selling stock photography through a host site such as Shutterstock. Selling the licensed use of your photos for online articles and design work will give you the opportunity to pick up a small amount of passive income. Try to take interesting and unique photos that aren’t already well-represented. Photography is also a great way to get to know a place. Think about representing abstract ideas within your photos. For example, ‘social media’ and ‘personal development’ are high-traffic search terms. Tagging your photos with a range of searchable hashtags will help make your photos more visible to internet users. Make your photos high-quality, learn how to use photo editing software, and upload in large file formats. Once you have uploaded your travel snaps to a service, link them to your website or travel blog to help you gain more personal publicity. Check any visa restrictions when it comes to selling online products during your time abroad, or set up a bunch of photos before you go to generate some passive income. You can always monetize your travel photos when you return home. There are vast arrays of casual online positions for those who provide creative services such as copyediting, as well as administrative services like data entry. You can set up a profile for free on many freelancing sites and link them to an online portfolio or LinkedIn page. This will add legitimacy to your new online business. Sites like UpWork allow you to bid for jobs and set up your own pricing structure to meet your needs. You can find many remote working contracts that can tie into your scheduling needs, regardless of how busy you are. You may be asked to appear for telephone or Skype conferences to meet the demands of certain projects. Therefore, you should ensure that you have a working phone abroad and a reliable internet connection. Again, you need to make sure that your visa terms permit work like this, since many study abroad visas limit (or prohibit) the ability of students to work. Also, you don’t want to be too distracted by work demands. Virtual assistant work is a good option for short-term casual work over the summer months and can help you build up some extra money before you go on your study abroad program. This method of making money online requires a fair amount of initial research and may not be a practical option for younger students of high school age or early college years. However, once you are up-and-running with your online web store, the sky’s the limit in the amount you could earn on a monthly basis. This is the ideal financing method for anyone who loves spending time on Instagram and shopping online, and you can set your store on pretty much autopilot whilst you’re traveling. Dropshipping is a convenient arrangement where an online seller can sell a third-party supplier’s products for no upfront costs. If you have no web development skills, don’t worry; you can easily create an online store. Use an e-commerce host with a good selection of features and templates, or use a free WordPress plugin to convert a blog into a store. Other options include Etsy or Amazon, which will ultimately be a lot less work for you. The initial product research phase will help you find your target market. Check out competitors and create a branded image that draws in the right kind of customer to your sales pages. You could place a small amount of daily budget on paid product promotion campaigns on Facebook, Instagram, and Google Adwords — but only do this if you’re already making money. When you have started to make a profit from placing orders and advertising, look for ways you can gradually pull back from the admin tasks. Invest in automated apps and virtual assistants to help you run your store on a nearly passive basis. Doing odd jobs at home before you leave can be surprisingly lucrative, and once you are abroad (and if your visa allows it), you may be able to take on some odd jobs in your host country. Look in your local community and find odd jobs you can do for a bit of extra cash in your spare time. You are never too old to do a bit of gardening or car washing for a neighbor in need! You can set up a profile on service sites such as Yelp or Angie’s List. Start collecting positive reviews from host families, friends, and contacts. You can also offer services like babysitting and dog walking through advertising in local newspapers. Alternatively, you can pin your contact card on a local community notice board to help you bring in your first few customers. Carrying out odd jobs will help you explore your new locale and get a feel for the everyday culture of a place. Plus, you can help people in need and collect some good karma points along the way. Win-win! You may find that informal work or volunteering for a charity or local group will allow you to still focus on your studies, and though you might not make any money, the experiences will make you a lot richer! There you have it! Five ways to make money while studying abroad. These options maybe not be available for all students during their study abroad terms; for all of your income-generating activities, make sure you are following the rules of your visiting country. Pay close attention to your host nation’s tax obligations and employment laws for international students, too. You should be 100% clear on any visa restrictions well in advance of your journey so that you can plan and save effectively. Make sure to talk to someone who can help you decipher international visas in more detail. Photo credit: The Digital Marketing Collaboration.